For more than a century now across the eastern portion of North America, burials of ancient people who possessed a very tall stature have been uncovered. 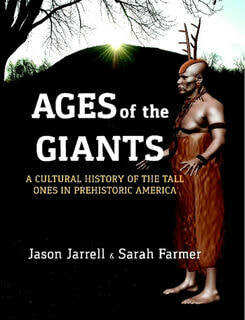 Ages of the Giants utilizes actual archaeological reports and the records of American Antiquarians, along with numerous historical chronicles and press accounts to document the cultures of a distinct sub-population of large, powerfully-built individuals of extraordinary height who inhabited ancient North America for thousands of years. The product of a decade of research, including fieldwork at ancient sites and the study of thousands of pages of archaeological literature, Ages of the Giants traces the history of the ancient Tall Ones across four millennia, and features in-depth descriptions of the cultures they founded, as well as their traditions, cosmology, and settlement patterns. "Mr. Jarrell and Ms. Farmer have done an excellent work here! For the true historian who is skeptical of new found claims and theories, this book allows you to form your own conclusions with evidence and documentation. I cannot wait for their next work to be published to answer questions that I have from reading the 1st book. I recommend this book to any who truly have questions about the Native Americans who were here before!I will leave one word for one to savor......GIANTS!" "I've had the good fortune of working with Jason and Sarah over the last few years, helping out where possible. As it turned out, however, I learned much from their work, and will actually be referencing them when republishing my own work, A Tradition of Giants. What they have done is what Vine Deloria always suggested on this subject, i.e. scour the libraries and see what other scholars have discovered, however overlooked and forgotten. We live in a very unforgiving academic clime, and worldwide. It has been traditional that academia in general sets the pace and authors the textbooks. But such is not the way of truth, it is simply a survival of the fittest. Hence special projects are undertaken from time to time to restore balance and to keep alive the most outstanding facts so that succeeding generations may have access. Jarrell and Farmer aren't going to get rich selling this book because it's real and serves an important purpose toward establishing the facts of academic treatment, pro and con, of a physically remarkable race internal to Indian races. It's a decent overview of the distinct likelihood of these people having been in charge of all Native American affairs throughout the Archaic period and into the three segments of the Woodland. By integrating themselves seamlessly at the core of family and tribal politics through and through Eastern North America from a remote period, they became the mouthpieces of the Great Spirit and were doubtless honored as such. Native traditions as received through men like Vine Deloria relate that taller men were always sought out by the young women for marriage--similar, I would imagine, as young women today seeking out medical students to ensure a comfortable future for themselves. I'm only halfway through this book now, but thought it might be advantageous to put in my 2 cents at this point." "Carrying the torch of the late Vine Deloria Jr, and the current scholar Ross Hamilton, Jason Jarrell and Sarah Farmer have presented an extremely compelling, and credible case for the emergence of a sophisticated elite with pronounced physical features, and commanding stature within the ancient Native American woodland cultures, spanning several thousand years. Outlined in brilliant archaeological and anthropological detail, this book is very academic in nature, and well sourced, with some 445 footnotes, and hundreds of additional references from archaeological works, excavations, bulletins, county histories, and news papers. The chapter on Aryanism, Eugenics and the Ancient Giants, was an extremely fascinating read which really hit home the sort of psychology of certain heads of institutions and prominent wealthy families who had a vested interest, and disinterest in the Tall Ones! Amazing Art work by Marcia K. Moore provides us a forensic recreation - a glimpse of a statuesque elite Adena man, and woman, as well as a cloaked Hopewell shaman - based on actual archaeological measurements! If you enjoyed Ross Hamilton's "A Tradition of Giants" then I highly recommend you read this book!"